Brrr! It is COLD this morning here in New England. I so wanted to stay in the bed this morning; but I have resolved this year to be a bit more healthy and that includes doing a 30 minute workout at 5:30 every morning (well maybe not every morning!) I try to do two days and then take a break for a day and then two more days. I always feel so good for the rest of the day after I do it. The card I have to share for today is actually last week's SCS sketch 264. I know I'm a bit behind in posting it; but better late than never right!! I also used another former KWerner Color Inspiration challenge that I did not participate in. The colors were Basic Grey, Mustard, Rust and a neutral. I started with a Basic Grey base and then added a layer of More Mustard which I ran through my CB with one of my new embossing folders. In retrospect, I probably could have left this step out as you can't really see the embossing behind the three vertical panels. For the panels I used some various ink pads and color box chalk inks to cover the paper and then I sprayed them, crumpled them up and when I straighten them out, I went over them with some more Grey and Really Rust ink. 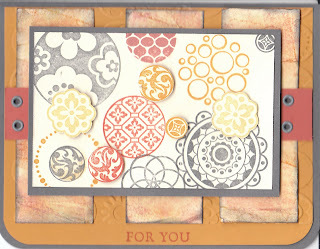 I used SU's Circle Circus for the main images with Rust, Charcoal Chalk ink from Color Box, Mustard, and Saffron ink. I did cut out a few of the circles and use some dimensionals to attach them to the front. I was happy with the way this turned out, I hope you all like it too. I'm off to do a bit more stamping before my little guy comes home from pre-school. I will be visiting a bit later, can't wait to see what you've all been doing today!! I really like this card! I have got to get these circles. Great job with the layout.